Born : 1977 in Mangalore Karnataka. Director of Born free Artist group, Mangalore. I believe that my paintings are the creations that just happen. What I create with colours and brush on canvas, often opens up a plethora of thoughts, dimension & feelings in the minds of the viewers. Therefore my paintings always remain fresh and dynamic in their very essence& presentation. My creativity uses colours & tonal values, metaphysical visual patterns and divisions, spaces that are interdependent with rolling forms -all in a visual language that reflects the inner urges and complexity of human life. I find it blissful. I think it can help me rise above the banal, yet keeping myself in the domain of human psychology. My creations extend from my fantasy, dreams and imagination; it gives tangibility to my thought processes. I confirm to sensitive tonal values and produce divisions of picturesque spaces which are interdependent with the rolling forms. The visual language reflects my inner urges and the complex its of my life. It is an attempt to portray my deepest thoughts in my own style and technique, to present the fine intricacies of my life and thought forms. I would like to share this personal artistic journey with the viewers. Present and project my variations in my distinctive style. 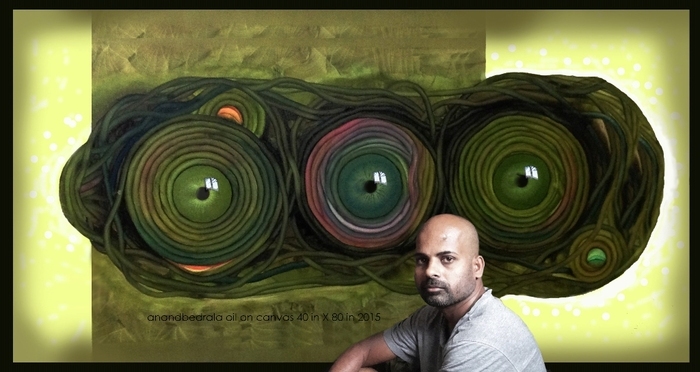 I Glistening abstracts, pleasing patterns and earthy hues amalgamate to form harmonic visuals in my paintings. As if an archaeological survey, my paintings are layered to give the impression of a pulp of animated objects, curled up together to bring life to the idea. As if barks of perception were cut and collaged together to perfection in good light. Calm settles hues that speak in paint, ideas translated onto a canvas with spirit and gait. My patterns curve and swirl to illustrate the intricacies of my endeavours, I confess to be having an urge to rise above the materialistic humanness, containing myself to the same sphere. My works are intoxicating and intense in the non descriptive lineage. My realistic works speak in grandeur of my understanding of light and silhouettes being of particular focus. I stands up to a promise, creates tranquil magic with consistency and true spirit. In this dynamics of sharing the innate thought and feelings with world of viewers, The Contents improvises on my own style and technique in each painting. I present paintings that are capable of in time conversations with viewers. I believe that my paintings are the creations that just happen. What I create with colours and brush on canvas, often opens up a pletora of thoughts, dimension & feelings in the minds of the viewers. Therefore my paintings always remain fresh and dynamic in their very essence& presentation.